Waze is one of Google’s navigation apps that is known for providing its users real-time data about potential hazards and dangers on the road. However, it also allows people to alert other users of the app the location of police on the road. Recently, some users have been using the app to let other users know where drunk driving checkpoints are. Last weekend, the New York Police Department sent in a letter to Google demanding that that feature be removed from the app. The police are concerned that alerting people of these checkpoints will impede their use. They believe that using this app to alert people of drunk driving checkpoints will allow them to remain on the road, and to remain dangerous. The main question is whether this is legal. It is possible that these users sharing the location of sobriety checkpoints is illegal, and Waze is breaking the law by assisting the dissemination of the information. 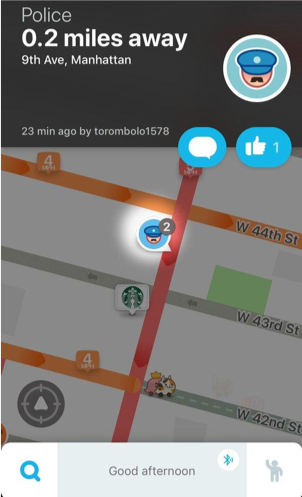 The New York State Police Department said that “Waze might be breaking the law by trying ‘to prevent and/or impair the administration’ of the state’s D.W.I. laws and that the department planned to ‘pursue all legal remedies’ to stop people from sharing ‘this irresponsible and dangerous information’”. However, it is not clear what legal steps might actually be taken. Waze does not allow people to specifically identify sobriety checkpoints. It allows them to alert other users where police are, and it also allows them to add comments to their post. Users are using that feature to specify where the sobriety checkpoints are. It is unclear what legal remedies are available to remedy this problem. Michael Gold, Google and Waze Must Stop Sharing Drunken-Driving Checkpoints, New York Police Demand, New York Times (Feb. 6, 2019), https://www.nytimes.com/2019/02/06/nyregion/waze-nypd-location.html.